Will you hold me while I cry? some pictures that I love. Jesus hugging and comforting us. Jesus is the Lion of Judah. Jesus is pictured as a lion. 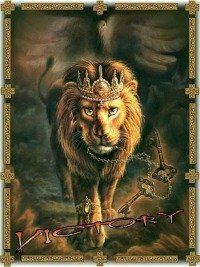 The image of a lion quickly communicates the strength and power of our Savior. There is no one stronger. There is no one who deserves more respect than Jesus. He is the King of Kings and the Lord of Lords. He is nobody's wimp. He has no fear of anyone or anything. No one makes him tremble. Commander of the Armies of Heaven. create a close loving relationship with him. The following video is helpful to me as I draw close to Jesus today. create fear in any person. If you have accepted Jesus as your Savior and you live for him, then you are his beloved. I hope you will be blessed by the enthusiasm that the lion expresses in his love for his beloved. I hope you will experience this video as Jesus hugging you. who are crushed in spirit." One of the most popular pages on this website is a page called Prayer for a Broken Heart. It has two prayers and it has unique teaching on the subject of a broken heart. There are many reasons we seek comfort from the Lord. A broken heart is one of them. For a list of all the prayers click Prayers for All Occasions. Note that my book for women called At Home in God's Sweater includes teaching on receiving comfort from God. This page was originally presented on April 7, 2014 and repeated Feb. 16, 2015.